Bamboo shoots are the future bamboo. As the Khmer saying goes, "Bamboo shoots are the future bamboo". “Bamboo shoots” are young people who will grow up to become an important resource for their country. A country’s development therefore depends on how we invest in our young “bamboo shoots”. With young people aged 15-24 comprising 22% of the total population, Cambodia is entering a demographic window of opportunity. However, youth cannot reach their full potential and contribute to their communities if their path to development is interrupted by early marriage, teenage pregnancy and HIV/AIDS infection. In partnership with the National Institute of Statistics, UNFPA analysed fourteen years worth of data on sexual and reproductive health of young people between 2000 and 2014. Below are five facts about the challenges Cambodia’s young people are facing, and what progress has been made since 2000. Using a condom can prevent unintended pregnancy and the spread of sexually transmitted diseases including HIV. However, the use of condoms among young Cambodian men dropped significantly from 31% in 2005 to 18% in 2014. From 2005 to 2014, the percent of women who have a comprehensive knowledge of HIV/AIDS declined from 51% to 38.5%. As for me, there was a slight increase (from 45.9% to 47.6%). Among all age groups, adolescent girls came in the lowest (about 30%) in terms of understanding HIV risks. Without proper knowledge to make decisions about their reproductive health, young people are vulnerable to sexually transmitted diseases. Over the last decade, the number of women using contraceptives has increased, which is a good sign. Yet, the risk of teenage pregnancy still persists: almost 90% of sexually active women aged 15-17 years old are not using any contraceptive at all. Modern contraceptives such as oral pills and injection appear to be the most common method. However, educated and wealthier Cambodian females are turning away from the modern methods in favor of tradtional ones, such as withdrawal method, which carry a much higher risk of unintended pregnancy and offer no protection against sexually transmitted infections. 1 in 8 girls aged 15-19 in Cambodia have already become a mother or are currently pregnant with thier first child. The number is particularly high amongst 18-19 age group (24.6% compared to 4% for 15-17 age group). Furthermore, girls living in rural areas are twice as likely to begin childbearing compared to those in urban areas. 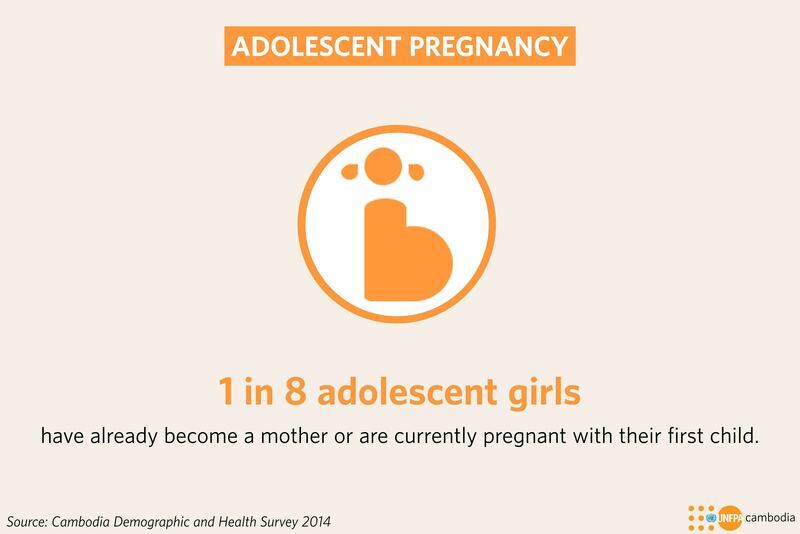 Teenage pregnancy poses both health and socioeconomic challenges for girls, and hinders their ability to break out of poverty and achieve their full potential. 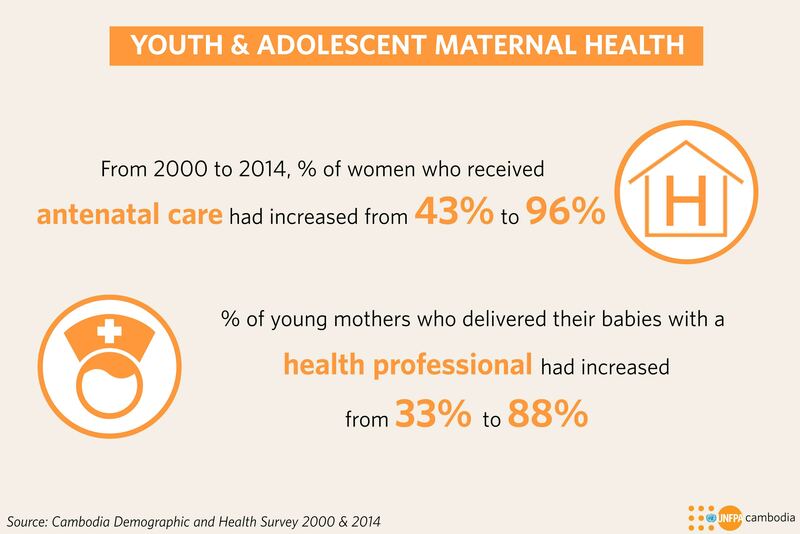 The good news is many young women are going to health centres for antenatal care and delivery! Getting help from health professionals can save mothers' and newborns' lives (in case of labour complications) and ensure that both are healthy and happy. All the data used in the infographics are taken from the Sexual and Reproductive Health of Adolescents and Youth: Analysis of 2000-2014 Cambodia Demographic and Health Survey Data, produced by the National Institute of Statistics with technical and financial support from UNFPA Cambodia. You can download a copy of the report in both English and Khmer.